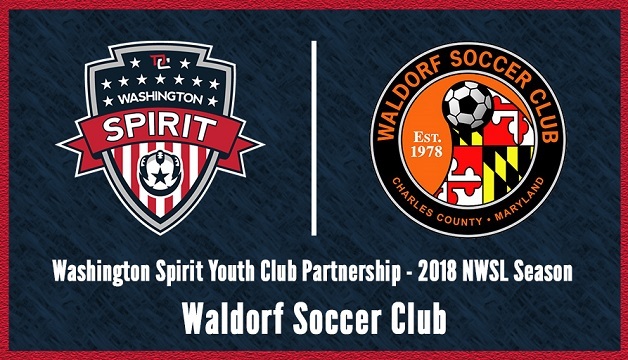 Boyds, MD (April 4, 2018) – The Washington Spirit has signed Waldorf Soccer Club as an official Youth Club Partner for the 2018 National Women’s Soccer League season. The Community Partnership provides numerous benefits and exclusive opportunities for Waldorf SC members, including an interactive training session with Spirit professional players and coaches, the chance to attend an open practice with the Spirit first team, preferred access to youth experiences at Spirit home games and discounted season tickets for the club. Waldorf SC is celebrating its 40th anniversary in 2018. The club has been a pillar in the Maryland youth soccer community since 1978, developing players in accordance with their skill level and desire, in a safe, professional, positive and fun environment. For more information on Waldorf Soccer Club, visit www.waldorfsoccer.com. For more information on Washington Spirit Youth Club Partnerships, visit washingtonspirit.com/youth-club-partnerships. Tickets for all Spirit home matches are available now at https://tickets.washingtonspirit.com.